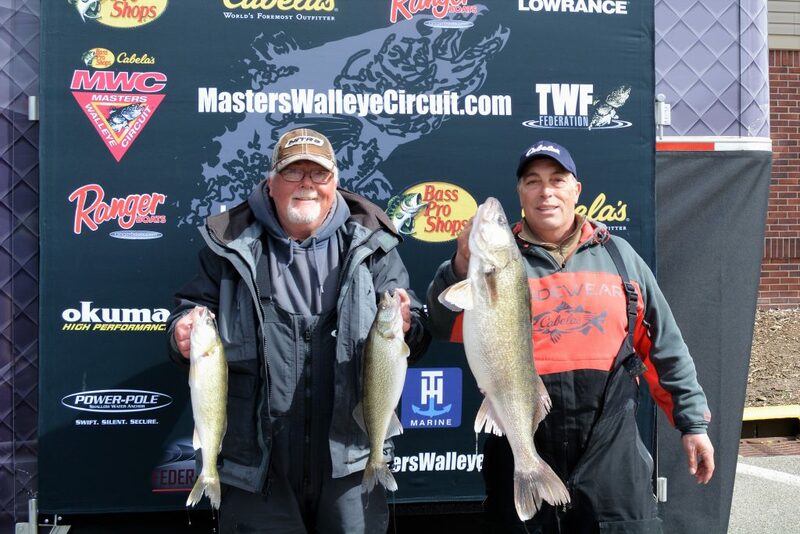 Masters Walleye Circuit – Great Walleye Tournament Fishing Starts Here! Under the umbrella of The Walleye Federation (TWF), the Bass Pro Shops and Cabela’s Masters Walleye Circuit is North America’s longest-running and undisputed leader in team walleye tournaments and as an inductee into the freshwater fishing hall of fame, has set the standard for competitive walleye fishing for 35 years and is open to avid walleye anglers from all walks of life. 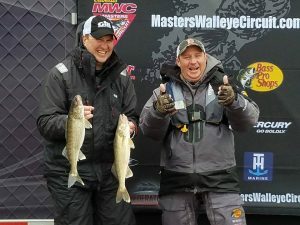 The 2019 schedule includes eight qualifiers in six states, plus the 2020 Bass Pro Shops and Cabela’s MWC World Walleye Cham pionship. 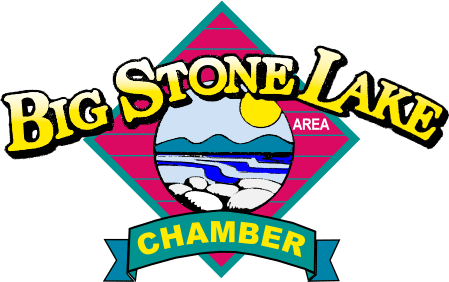 Registration is now open for all events, and the registration deadline for the Big Stone tournament is close of business Monday, April 22. Visit masterswalleyecircuit.com for full details. 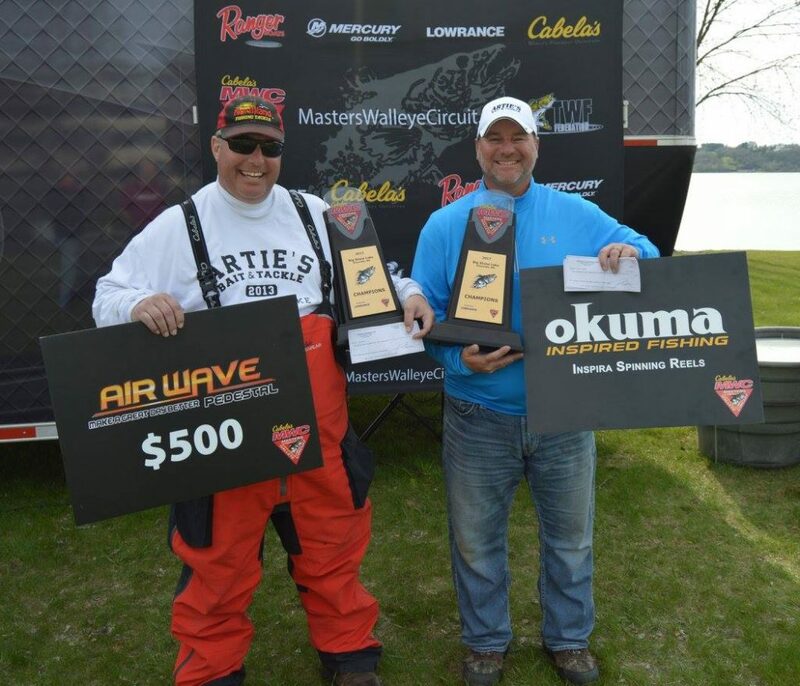 Jim Schiefelbein (left) and Chad Knottek (right) take home the championship trophy from the Detroit River. 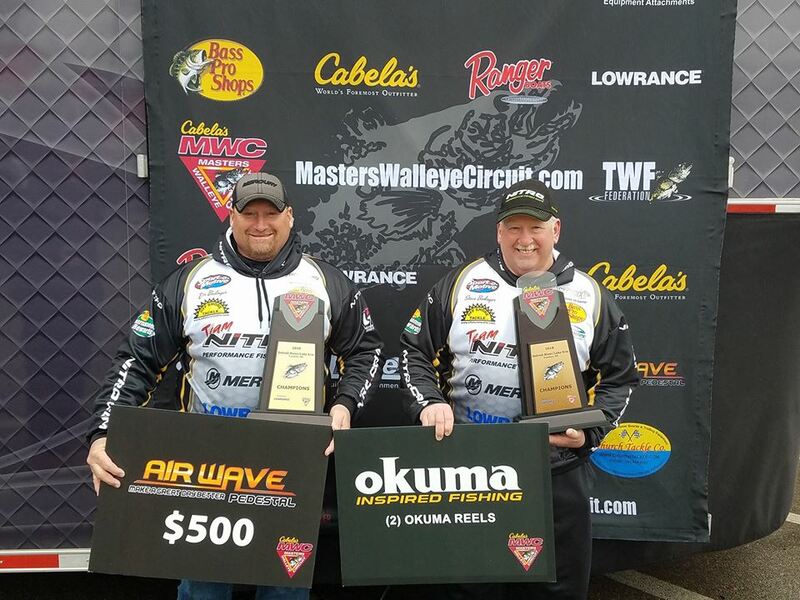 Trenton, MI—April 14, 2019 — With wind and water conditions less than ideal, Jim Schiefelbein, Marseilles, IL and Chad Knottek, Ottawa, IL weighed 22-08 after day-one and got just what they needed, 15-11, on day-two, for the win with 38lbs 3ozs. 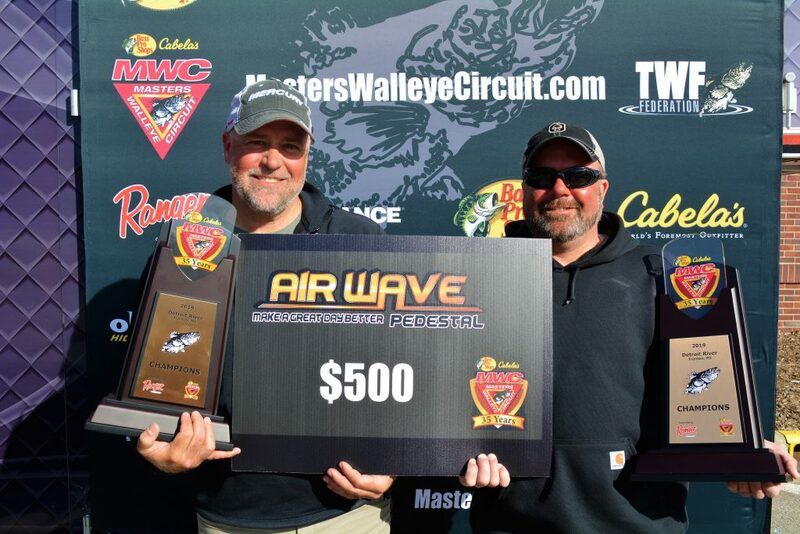 Presented by Ranger Boats, this year’s Detroit River event pitted anglers against one another in a River Only format, a first for the Bass Pro Shops/Cabela’s MWC. 75 of the “Toughest walleye teams on planet earth” took off from Elizabeth park both Friday and Saturday mornings to face a fast moving and dirty Detroit River. Making matters worse was the 30-40 mph South winds taking aim at anglers and their boat control capabilities. Schiefelbein and Knottek leave, with $15,850 in cash and prizes, including the $10,500 first-place cash payout, $3,850 cash from the option pot, $500 AirWave certificate and a $1,000 Cabela’s National Team Championship Prize Package including paid entry into the Cabela’s NTC, travel stipend, team jerseys and plaques. Butch Rabetski (left) and Jim Passo (right) landed the largest fish at the Detroit River, a 9-07 hog! 625 fish weighed a total of 1774lbs- 12ozs during the event. Jim Passo and Butch Rabetski took the top “Big Fish” honors over the weekend with a 9-07 walleye. National Professional Angler Association member Rick Kretchmer presented the NPAA’s Youth and Family Fishing Clinic Friday afternoon, immediately following the weigh-in and gave away fishing rods to attendees. Under the umbrella of The Walleye Federation (TWF), the Bass Pro Shops and Cabela’s Masters Walleye Circuit is North America’s longest-running and undisputed leader in team walleye tournaments and as an inductee into the freshwater fishing hall of fame, has set the standard for competitive walleye fishing for 35 years and is open to avid walleye anglers from all walks of life. The 2019 schedule includes eight qualifiers in six states, plus the 2020 Bass Pro Shops and Cabela’s MWC World Walleye Championship. Ponca City, Okla.—March 26, 2019 —The 2019 stop at the Detroit River, launching from Elizabeth Park in Trenton, MI, will provide the MWC anglers with another quality opportunity for big, pre-spawn bites and they won’t have to leave the river to do so. 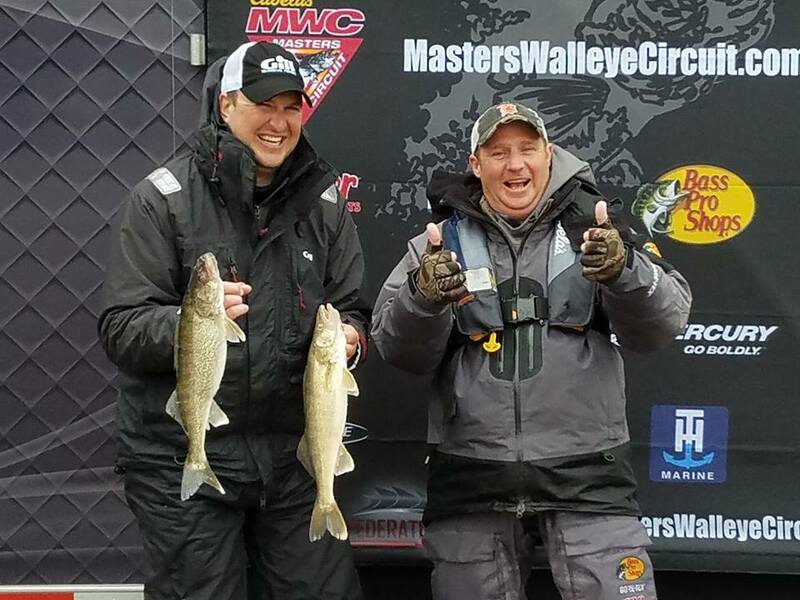 Dan (Left) and Steve (right) Bodinger , 2018 Detroit River Champions. Presented by Ranger Boats, the “Toughest Walleye Anglers on Planet Earth” will see a small change to the boundary locations for this event. The BPS/Cabela’s MWC fishermen will be kept in the river for the duration of the event. This change is, in large part, due in response from anglers polled over the course of previous MWC seasons. And finally, this event will serve as our “Last Chance” qualifying events for the 2019 Bass Pro Shops/Cabela’s NTC at Sault Ste Marie, MI. in May 30-June 1, 2019. The top 10 teams at the Detroit River not already qualified can earn a spot in the 2019 NTC! Daily live weigh-ins at Elizabeth Park, Trenton, MI are free and open to the public beginning at 3:00pm both days April 12, 13. If you can’t make it in person you can watch the weigh-ins live, online, at masterswalleyecircuit.com or on our Facebook page. Under the umbrella of The Walleye Federation (TWF), the Bass Pro Shops and Cabela’s Masters Walleye Circuit is North America’s longest-running and undisputed leader in team walleye tournaments and as an inductee into the freshwater fishing hall of fame, has set the standard for competitive walleye fishing for 35 years and is open to avid walleye anglers from all walks of life. The 2019 schedule includes eight qualifiers in six states, plus the 2020 Bass Pro Shops and Cabela’s MWC World Walleye Championship. Registration is now open for all events, and the registration deadline for the Detroit River tournament is close of business Monday, April 8. Visit masterswalleyecircuit.com for full details.